Nothing ironic about that picture. Show it to a hipster, he/she will blow Clove cigarette smoke in your face, angrily put their macbook back in their messenger bag, slide on their Ray Ban wayfarers so you don’t see the tears, briskly walk back to their chained up fixed gear bicycle (fixie), button up their vest, and speed home to cook some vegan comfort food. I’m confused… is Pabst a hipster beer? 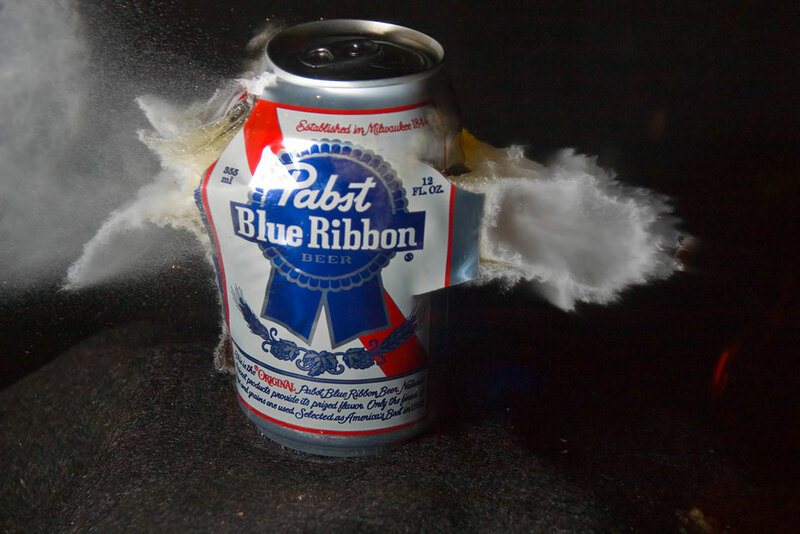 Apparently PBR tastes like piss and nobody drinks it, so hipsters drink it to be ironic. Interesting. Personally, I enjoy the taste and enjoy drinking it. I liked that, for a period of time after Budweiser got purchased, Pabst was the largest American owned brewing company. Everyone has their preference I guess. Eh, I’m no beer connoisseur. I drink whatever’s on hand, and haven’t had enough different kinds of beer to have a preference. Personally, never had a PBR. Yup, I find it funny how people like to deride something without even trying it. I, myself only tried it for the first time this past year. And I was pleasantly surprised. And as I’ve mentioned, most who have tried it were equally surprised. Not saying it’s the best beer on the face of God’s green earth. But it’s decent. And by far not the worst. That’s about the best use of Pabst I’ve ever seen. I would only drink it on a dare, actually we would have to be pretty deep into a double doge dare you scenario. My hetero-lifepartner and I used to destroy 30-packs of PBR on weekends. We were also looking for a way to weaponize PBR bottle caps via 10ga shotgun. Yeah, it’s so fun to trash PBR. Almost every person I let try it liked it better than Bud. I’m not a hipster by any stretch but when I don’t feel like drinking craft beer (what I do 80% of the time), I enjoy it. And did anyone ever watch Blue Velvet? Frank Booth (Dennis Hopper): What kind of beer do you like? Jeffrey Beaumont (Kyle McLachlan): Heineken. Frank Booth: [shouting] Heineken?!?! F*** that foreign s**t! Pabst Blue Ribbon!!! Haha! A lot of “up-and-coming” rock bands tend to drink PBR as well. ENDO-Mike, I can only wonder after your commentary that you either live in San Fran, another part of California, or you live in Portland, Oregon. I don’t live in Portland, but I go there lots from Hood River when I’m back there. As you mentioned, I hear San Francisco is another great place to observe hipsters in their natural habitat, but I haven’t been there yet. Thank God for Oregon beer is some of the best out there, and cheap. Although a contender, Lagunitas, has an IPA that’s worthy of mention, but it’s from Chi-com owned state of California. Lot’sa great beer…. Portland, yeck for Hipsters. But don’t worry they don’t drink good beer anyhow! I hate how hipsters have possessed my favorite beer. I’ve been drinking PBR (Pabst Blue Ribbon) since I was 15. I drink it because its cheap as hell and tastes o.k. I also smoke clove cigarettes, but its because they taste good and smell terribly offensive and tend to upset people. Which is hilarious. I used to drink PBR when I was in because it’s hard to beat $5 a twelve pack. No taxes meant $20 at the 7 day store got you a serious amount of beer. I grew to hate it in college and then started drinking it again in the hipster bastion of Los Feliz LA and thanks to the price, i like it again. Dollar PBR during Dodger home games is easy on the wallet. Hipsters though are hard on the eyes.